I am always proud of my librarian advocacy comrades, but I've never been as proud of them as I was this past weekend at Urban Librarians Unite's 24-Hour Read-In. 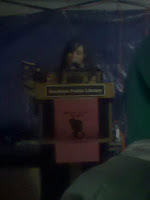 The event was a huge undertaking and required every ounce of energy, passion, and patience that a librarian has. My hats off to everyone involved. 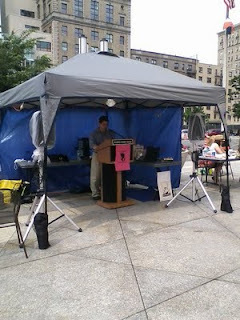 I didn't get to take many pictures during the hours I attended, but here's one of Councilman Vincent Gentile (who is a huge library advocate on the NY City Council), reading Neil Gaiman's wonderful The Graveyard Book from my Nook Color on Sunday. All the people who read, whether it was in the rain or the sunshine, were wonderful and amazing. And I'm grateful for the people who sat in the audience and signed our petitions and bought coffee and pizza and donuts and who were just THERE at any point during the 24 hours. My faith in humanity has been (slightly) restored. So, we're coming down to the wire now. The New York City Council votes on the budget in 17 days. If you're an NYC resident and haven't yet signed a library petition in your borough, please click on the appropriate link below and add your name. Every little bit helps. Thank you all. We're almost there.